It's hard to believe that The King of Kong is a decade old now. A seminal work in the history of video game movies, it presented a thrilling David and Goliath tale which focused on humble schoolteacher Steve Wiebe's dream of being the world high score holder for Nintendo's arcade smash Donkey Kong, and the apparent attempts by (then) champ Billy Mitchell to prevent that from happening. I have not watched King of Kong, I have not watched Chasing Ghosts. I mostly don’t watch anything that I’m in. I mostly don’t read anything [about myself] either. On a very regular basis, people that I know flip their lid because somebody says something negative. And they say I gotta see it. Click. Delete. Why do I have to see it? Why? I know it, I lived it, I was there, and without the creativity of Hollywood. It was far greater to live it and enjoy it. When [King of Kong] first came out, I got some emails that were so vile, I wouldn’t read ‘em to anybody. As time went on, they’ve certainly come full circle and I get very little of that now. Most everything’s extremely positive. I’ve actually had people insinuating that I’m lying. On the souls of my children, I haven’t watched it. I had one guy, you might call him a very influential guy, a guy very extremely connected to the movie — extremely connected — question it. I said, well, we could always make arrangements for a polygraph. And I said, if I take a polygraph, maybe he’d wanna take a polygraph, too. And believe me, he doesn’t want to get anywhere near a polygraph. Billy Mitchell: The movie has tremendous accuracy. And it also has tremendous creativity. That’s what makes it a good movie. If you’ve ever watched anything that had 100% accuracy, you’d be watching the National Geographic. That would stink. I’ll pick on you here, ‘cause you’re the only one on the phone. Do you really think I answer the phone at home, “World record headquarters?” Do you really think that? Billy Mitchell: I’ll give you a hint — I don’t even have a home phone! That wasn’t a real phone! Kotaku: So you were playing around, I guess, is what you’re saying? Billy Mitchell: Let me do another one here. Standing in the kitchen of the restaurant. 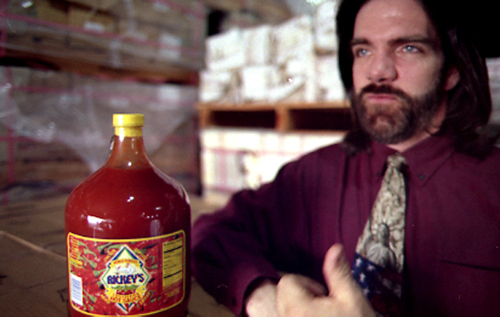 “Billy Mitchell always has a plan.” Do you recall that? Billy Mitchell: Okay. So, they asked me questions, and they go, “If something were to happen, you’d probably have a plan for it.” I said, “Of course.” “Okay, well, of course what?” “Well, we’ll see what happens, we’ll see what plans I have.” “Oh no no no, do it again.” Okay, we’ll go again. “Well, I guess we’re gonna have to make a plan here.” “No, no, no. Go again.” I guess I did it about ten times. Bang, and I hit the one on the mark they wanted. That’s creativity. Do you really think that blond-haired, blue-eyed Steve Wiebe could play a bad guy? He’s a nice, mellow kinda guy, and that’s the way he is, and I think if you tried to ask him to do something that he doesn’t have in his personality, then it would have just looked foolish. I’ve actually never, ever, ever, not once, ever had a negative encounter face to face. EV-ER. And I’ve had people say they’re gonna show up at a convention because they wanted to punch me. But then when they get there, after a little conversation, I guess they sort of catch themselves a little bit. I said to a guy, “Do you really think Charles Bronson makes a movie that they show in a theater, and when he’s all done he goes on the street and starts shooting people? Is that what you really think happens?” If you think about it, that’s the comparison. It’s a hell of a lot more fun than being the good guy. ‘Cause I’ve played both. You could ask the average person about their favorite character in Star Wars. Most people are gonna say Darth Vader. Who the heck’s gonna say Princess Leia? I see Steve at the Kong Off once a year, although last Kong Off, I didn’t see him. We say hi, I don’t express a bit of bad blood or ill will towards him or anybody. And I don’t ever get that impression from him either. I don’t know if I’ll see him again, because he didn’t go to the last Kong Off. I don’t know if his life has made a turn in a different direction. I hope the best for everybody. The full interview is well worth a read, and if you haven't seen King of Kong before, then you need to fix that; despite the fact that it clearly manipulates certain elements to create dramatic tension, it's still a fine film. Well that makes 2 of us so. He may as well watch the film if he's going to reference scenes from it. This is a great movie / documentary though, saw it on netflix a while ago it's awesome. It's probably best he doesn't. Megalomaniacs do not process humility too well. We're getting a big example of this right now on a grand stage, lol. Believe Billy, or Phil will come for ya!!! Seen it? Dude lived it! I enjoyed the movie, but it was a bit silly to see Billy Mitchell portrayed as a dream crusher. He's just a competitive guy. You can tell the movie is staged. I think they overdo the whole Billy is bad and Steve is good part. I think Billy was just better and Steve living out his dream held the record for a while and it crushed him when he lost it. There is a seen towards the end (it's been a while since I've seen it) where Steve says something to the effect that everyone thinks Billy is a jerk and that he himself is a nice guy. That to me isn't something that humble or nice guys really do is try to win popular opinion. If there was a negative experience with Billy then explain it but I think there are cracks in the whole Steve is the hero story. I don't buy that for a second. He loves filling the role of villain and saying he never watched the movies plays right into it. Darth Vader has never watched Star Wars for the same reason..
@cleveland124 actually a big part of it is editting. The movie producers and editors pointed out that the results in the movie are actually from them removing the parts where Billy is an even bigger jerk. So... No matter of the other guy is a hero, Billy is an jerk regardless. @bezerker99 Wait really? I think he's extremely bothered by negative press. People who actively avoid someone or something don't do it because they don't care. If anything, he knows it will bother him so that's why he avoids it was the feeling I got from reading this. I finally managed to go to Funspot in 2008, the same year the DVD came out. While Bill stopped coming up personally by that time, he still showed support for the gamers who competed in the tournament with special autographed posters and cases of hot sauce with specially designed labels commemorating the annual Classic Video Game Tournament. Yes, many of the other players featured in the movie were there for the most part. But a few years following its release, their attendance eventually dwindled to a handful. It could also be because of other internal things going on between TwinGalaxies and Funspot that I don't want to go into. Anyway, Bill's been nothing but a professional the 2 times I've interacted with him. The first time was on the phone back around 2001~2. I was at Robert Mruczek's place (Atari Star Wars arcade champion and...the guy who commented about the 'gummy substance' on the DK board in the movie) when he handed me the phone with Bill on the other line and he congratulated me on my new record on Crazy Taxi. I was stunned that he'd take the time out to congratulate me! At the time, I knew him as the first 'Perfect Pac-Man' record holder, so talked to him about that as well. It wasn't a long call, but it was inspiring! The second time was 5 years ago at a screening of the King of Kong at the 'Art of Video Games' exhibit at the Smithsonian in Washington, D.C. I had to duck out of the movie early in order to catch my train back to NYC when I ran into Bill outside the theater hall (which makes more sense now with this article. I had assumed he saw it). I was like, "Hey, Bill!" He said, "Hey." Then he asked if I was gonna catch the rest of the movie. I told him I saw it already and had to catch a train. I mentioned briefly that we had a phone conversation many years ago. But due to the time and me just remembering other internal goings on between him and certain parties, I decided to leave it at that. He did stop me for a second so he could give me an autographed poster and a bottle of hot sauce with a commemorative label. I did miss out on a Steve Sanders autograph, but Walter Day had already introduced us inside which was fine. So yeah, at this point I think he's an alright guy. As is mentioned in the movie, a lot of his public side is this 'persona'. It's kind of like a character he portrays. Now, if he's like this outside the spotlight, well I don't see how anyone can judge unless they've spent a considerable amount of time in his company. Like, a lot more time than I have. @Shiryu Rickey's is on point, it's so good! I really need to order some for myself sometime. Definitely a fine example of a "Dramatic Documentary" and due to the content, one of my favorites... I watch it every few years in the summer time. I actually prefer Billy Mitchell since he is who he is and embraces his "villain role" for mild fame... I see Steve Wiebe as a crybaby that is trying to attain a worthless record in order to somehow make his life better. In reality, they're probably both nice guys. @masterLEON Damn fine hot sauce. Damn fine. When I saw this movie, I thought it was mostly acting and mostly made up. I guessed the actual video game playing and record setting was real, but that they all would want to make it a bit more interesting and agreed to exaggerate the rivalry. It just didn't seem realistic. All the lines were too perfect. Yes, like watching star wars. It was very entertaining though. That's his point though. He was actually there when the scenes were recorded. And he knows what's in because those are the scenes people write him about. By the way, the current King of Kong is Wes Copeland. After Bill took back the WR from Hank Chien in 2010, Hank regained the title and pushed it up higher over 4 years. Then Robbie Lakeman took the title in 2014. But a year later, Wes Copeland entered the running. It's been going back and forth between Wes and Robbie since then with Wes currently sitting on top for the past year. 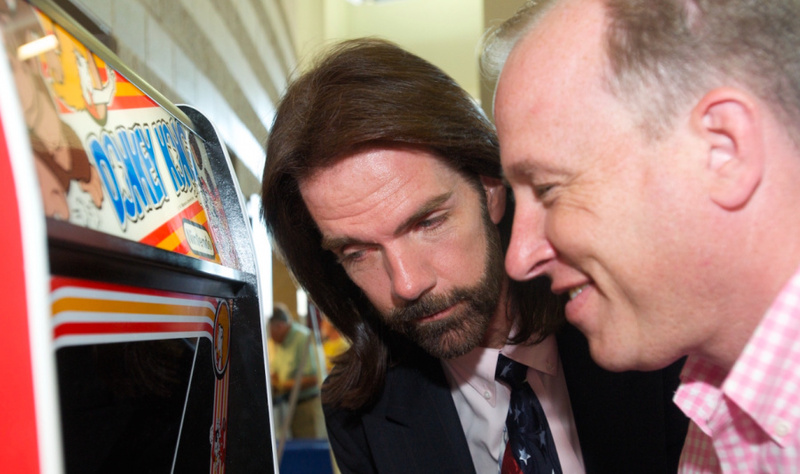 Billy Mitchell will always be the King of Kong... and if he wanted to re-gain the WR, he could (just ask him). Fair enough. I remembered feeling that the movie was dramatize when I saw it. It would be boring if there was no conflict and drama to get the viewer’s attention. @ultraraichu You know who else lost a court battle against Regular Show? MY MOM! 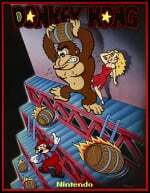 Anyhoo, I think I heard about a King of Kong musical in the works? Heh. They'll musical-fy any film. Lol whatever you want to believe. The person below had 2 good interactions with him, he devotes time and money to charity. In the movie he bought a qbert game and sent to funland an elderly gamer. There is lots of people in online discussion groups that think otherwise. I've not met him personally but I wouldn't let an obviously biased movie affect my opinion of him. I own this movie and it is a great watch. It's clearly slanted storytelling, though, favoring one person over the other. Still a great movie, though, and a good amount of actual historical context as far as the actual Donkey Kong game goes. Really fun documentary. It's obviously slanted, but it's also obvious Billy is just turning his natural personality up to level 11 for the sake of entertainment; much like a professional wrestler. I don't believe for a second that he hasn't watched this documentary dozens of times. Based on multiple anicdotal accounts from various podcasts, Billy is very nice at expos and when meeting fans. He also takes the time to help the retro gaming community. What an absolute legend this guy is. Simultaneously a bad sport and a brilliant one at the same time. He can be a bit of a weeeeeeeener, but he knows it, takes it well, and plays the lovable pantomime villain. Reminds me somewhat of Dave "the games animal" Perry. Characters like this make retro gaming interesting. As others have said, it's a little like WWE. @masterLEON Wow I had no idea you were Crazy Taxi record holder - serious kudos mate! I'm terrible at that game but I love it like its one of my own. No arcades near me had it, but I had read about how it was so awesome and I pre-ordered it for Dreamcast with Special Reserve. I distinctly remember when it arrived in the mail and my jaw hit the floor when I booted it up. Those graphics mixed with those songs and that level of open world freedom just blew my mind. It was the game I'd show all my friends when trying to persuade them they needed a DC. Good times. @KIRO Wreck-it Ralph was amazing. "The only people in the universe who have never seen Star Wars are the characters in Star Wars, and that's cause they lived them, it's cause they lived the Star Wars!" I like to think I'm a nice guy, but no way I could resist watching a movie about myself. It's not an indulgence that would make me think ill/kind of anyone, as that feels like such an arbitrary way to assess someone's character. @samuelvictor Thanks, man! To be honest it's not something I lead off with in a casual conversation, LOL. Here, in a comments thread in an article about World Record holders, sure! I just don't wanna be like that Roy Shildt guy from the movie, creepy! That Dreamcast version of Crazy Taxi is still the closest you can get to the arcade version. Little known facts, though. The arcade version has some bugs that was fixed by the time it came out on the DC. First, it couldn't display the customer count past 199 customers accurately. It would loop back to 1 or something when it got to that point. Second, weird things happen when you go too fast. Due to the 'Limit Cut' technique, players can jump super high (high enough that I was able to jump the hill by the Heliport and almost land in the R.B. Station. You can go fast enough in a collision into a building that you could 'teleport' to different areas of the map. And you can go fast enough to slam sideways into a wall and get 'stuck', and farm tips for extra score. Obviously, some of those techniques are illegal when going for a record run. But yeah, the DC version is basically patched. Too bad I can't play it properly on a control pad, I need a wheel. My highest was around $58,000. @cleveland124 Exactly, no one who is truly benevolent will proclaim that they are better or have all the answers. Because if they had those qualities, they should be too humble to admit it. @masterLEON NL should ask you to contribute an article on the subject, or something... Also, you are my hero to my childhood self. What's he hating on Princes Leia for? @PlywoodStick Thanks for the kind words I'd love to write about Crazy Taxi, but that's gonna be a Titan-blocking wall of text, LOL. I do have the video of my WR run on my camcorder. I wanna upload it, the only thing is it's over 2 hours, and full of licensed music. I can mute the audio but it'll be pretty boring and people will just watch the end. I could do a voiceover, but it's over 2 hours, I'd run out of things to say after 30 minutes, LOL. I'll figure out something. @masterLEON - That's really cool man. I went to your bio, clicked your YT link and watched a couple videos. I've never seen someone play Crazy Taxi with anything approaching that level of mastery. Very impressive. I'm so bad at that game. Thanks for sharing. @masterLEON So cool to hear about all the tips & tricks, watched your $5000 video on your YouTube, amazing stuff to know the game that well. Again, major kudos. And what a cool game to be world champ at! I started my career in reality television, and everything Mr. Mitchell is saying is 100% accurate. Nearly every documentary and "reality" television show is fabricated. The truth is boring, and we crave drama. @bimmy-lee @samuelvictor And thank you guys for watching! @samuelvictor - I looked into your new avatar, you're a man of many talents as well. Those Twin Galaxies guys all had a weird man-crush on Billy and gave off an almost cult-like vibe in the movie. It definitely seemed as if they were all rooting for Steve to fail, even the ones who faked being nice to his face. Love how Billy claims that he was in character in the movie - as if he's a REAL actor! LMFAO! What you see in the movie is the real deal. Sure some things were made up or embellished a bit, but that guy has the personality of a wet blanket whether he's being filmed or not.